MGE is a British manufacturing company based in Colchester in the UK that has been manufacturing print equipment since 1970. All MGE equipment is manufactured to the highest standards in accordance with ISO 9001 and ISO 13485 Quality Management Systems and European CE Legislation. The full range of MGE Print Equipment is available through LithoTech International P/L. MGE will also work closely with our customers to offer tailor-made solutions. LithoTech International P/L has developed a cost effective and time saving filtration system for your circulation fountain solution. Filter out ink, spray powder, stock residue, blanket wash and other contaminants. This filtration system incorporates true filtration and has pressure release safety mechanism incorporated in the design. Our filtration system substantially prolongs the useful life of your dampening solution by increasing the period between having to dump your circulating dampening solution due to contamination. Depending on your situation we expect substantial savings as we have customers who have not "dumped" their circulating systems for over three months. As standard, all MGE dampening circulators are fitted with dual-layer composite filter bags which provide excellent protection against foaming and filter out particle impurities from the fount solution. 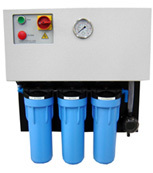 The FountXtend filtration system (PressMate FX-1) has been specifically designed to work in conjunction with these bags and further prolong the life of the fount solution by removing finer particles and contaminates using a 3 stage filter system. Results have shown that using this system has increased the life of the fount solution by up to 6 times minimising chemical usage and greatly reducing waste disposal and it's associated costs meaning that systems often pay for themselves within a few months. Central to the system is a self-priming pump that continually circulates the fount solution through 3 different filter processes. A gauge shows the condition of the filters and indicates when they need to be changed. In the event of a filter becoming blocked, the system will automatically cut out and an indicator light will come on. The system runs independently of press and circulator, so continues to clean even when the press is off-line. In addition, the pump has a run dry capability in case the fount is drained whilst the system is left running. Reduction in consumables costs due to lower chemical and alcohol usage. Reduction in waste disposal costs for contaminated dampening solution. Cleaner fount solution leading to less press downtime for cleaning. Improved dampening solution stability for consistent print quality. Reduced impact on the environment due to less waste disposal.